The other day I had the opportunity to be interviewed by Maura Welch, a reporter for the Boston Globe. She is working on a story about bloggers and Blogher, a conference to be held in San Jose, Ca., July 28 and 29th. Maura lives near by so we arranged to meet at a local coffeshop. I did not know what she looked like but she knew what I looked like since she reads my blog. While I was waiting for her I felt like I was going on a blinddate, was she tall, short, blonde, brunette or possibly a redhead? As I waited for her I looked at several people approaching the coffeeshop and wondered," is that Maura?" Well, when she arrived I knew that was her and she knew it was me! She is tall, blonde and attractive. We ordered coffee and settled in for a very pleasent, get acquainted interview. As Maura got to know me she made a comment that really gave me a big chuckle. "Why don't you go on TV? What struck me so funny was that Toby Bloomberg from Diva Marketing Blog has been saying the same thing to me for the longest time. Toby says, "someday Oprah." I always feel she is pulling my leg! If I ever wind up on TV, I think I should be on the Ellen Degeneres show!! Now about Blogher, I did not attend last year and heard great things about it, SO this year I am planning to go and not only that but my son Steve from "Off on a Tangent" is going with me!! What I would love to know is, "are any of my blogging friends going to be there?" From what I hear the most exciting part of these meetings is seeing your blogging buddies in person. "At 80, Millie Garfield of Delray Beach blogs once a week, posting her thoughts on everything from widowhood, aging, pop culture -- and when she's stuck for ideas, her secret recipe for mock chopped liver, a vegetarian version." Too bad the Sun-Sentinel doesn't provide a clickable link to your blog online or even publish your URL. I'll have to send Chantal an email about that. Yesterday afternoon "The Girls" were going to see "The Da Vinci Code." Even though I have been a fan of Tom Hanks for years, ( I first discovered Tom when he was on a TV show called Bossom Buddies ), I was turned off by the reviews and decided to stay home, I was just not in the mood for that type of movie.. In the afternoon I had a chance to finish Terri's book, "Lost Souls of the Witches Castle." One of the things I enjoyed about her book was reading about places I was familiar with. Toward the end of the book two of the main characters have dinner at Rosalie's in Marblehead. Many years ago that was the place to go, fine food and wonderful desserts. I remember going there with my husband and having the most delicious fruit tarts, the restaurant was very plain, you had to go up one flight, but the food was outstanding. I can still see the two of us sitting there and oh'ing and ah'ing about those tarts! The only movie on TV that night was "The Lady and The Tramp," an animated film made in 1955 about an upper class cocker spaniel and a mutt from the other side of the tracks. Well, I got hooked! What a delightful, heartwarming and humorous fairy tale. Ronni from over at Time Goes By has been writting about Ollie (the cat) and how he is feeling and adjusting to his new digs and here I was thinking and having feelings about "The Lady and the Tramp." Spending Saturday home alone turned out to be much more rewarding then going to the movies. "For Millie Garfield, 80, of Delray Beach, it's the interactive component of blogging that sets it apart from just surfing the Web. 'I wanted to connect to other people,' said Garfield, who runs the site called 'My Mother's Blog.' 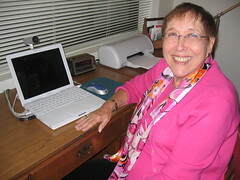 She is registered as one of the oldest bloggers on the Web, according to the Ageless Project, a site dedicated to promoting diversity on the Web. 'It makes my life much more interesting. It would be dull if I wasn't doing it,' she said. Garfield celebrated her 80th birthday on the Web with her friends. 'One couple made a video blog showing me how they were making me a birthday card,' she said. 'Here people understand me. If you keep reading a person, you get to know them.'" At least they got your name right. I'd like to see if they used any photos of you from your 'photo shoot'. In case you were wondering what happened at the last collage class, the instructor had to cancel that session and now it will be held this coming Tuesday. I'll keep you posted! For years I was a bookkeeper (today that occupation is referred to as an accountant) and took great pride in how I did my job. Not only did I do the company books, I did my employers personal checkbooks. In those days there were no computers, everything was done manually and what was important to me was the adding machine had a tape, if there was an error you could check your tape. Once a month I took a trial balance and most of the time it came out right the first time, no sweat, If by any chance it did not balance, it did not take me too long to find the error. Once in a blue moon I would have to put it aside and with a fresh eye check it again and without fail I would find the error quickly. What all this is leading up to is what happened with my checkbook. As soon as my statement comes in I make sure that my checkbook balances. What surprises me is how many people I know who don't check their statements, they just assume that the bank is right. Sometimes the bank does make a mistake or you might make an error. When I received my March statement I could not balance my checkbook, went over it and over it and finally put it aside, checked it a few days later and I still could not find the error. Then I got busy packing, going back to Ma. and before I knew it the April statement came in and I still had the error, looked and looked, couldn't find it. I was out a LARGE SUM OF MONEY. By this time I realized I had to go to the bank and GET HELP. The representative gave me a printout of my April and May transactions. I was hoping she could reslove my problem then and there but no, I still had to find it myself. So one afternoon, the house was quite, I had a strong cup of coffee and I was feeling up to the challenge. I pulled out the bank printout and lo and behold I FOUND th error.There was an ELECTRONIC payment that was taken out of my account by Blue Cross Blue Shield. I had given them the authorization to do this BUT what I discovered is that they do not notify you when they do this. I called them and asked them if they would notify me when this takes place. NO, they don't do that, you either pay by check or they take it out of your checking account automatically. Now that I have had this experience I have marked my calender so when the payment is made I will be aware of it and deduct it from my checking account. I wonder what percentage of people do not check their bank statements. I think it's a good idea!! The other day I had a wonderful "in PERSON" visit from the Islandwriter, Terri DuLong . She was visiting family in the area and dropped by with her lovely grand- daughter Kaela. It was like we were old friends and never ran out of conversation. Terry is very vivacious and it was a joy to spend time with her. 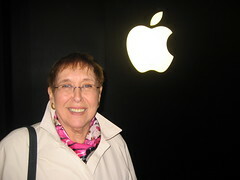 Terry has published two books, "Lost Souls of the Witches Castle" and "Daughters of the Mill." Not only did she give me a copy of each book, she signed them with very special words. In the past I have been present where I have heard an author speak, seen them on televion or read an article by them but never really spent time with them like I did with Terri. It's raining again today, a perfect day to curl up with a good book and a hot chocolate. I started to read "Daughters of the Mill" and I can see it's the kind of book you can't put down. First of all since I met the author I can hear her saying what I am reading and wonder how much of her is in the book. Since Terri comes from this area originally there are many places she mentions in the book that are famillar to me, having brunch at the Hawthorne Hotel, lunch at the Lyceum in Salem and even Jordan Marsh's famous blueberry muffins. Knowing the author, the area she writes about and the fascinating story makes it a great read. I should be making supper now but I have to read one more chapter! This time it's tape, volumizer and a radio. I can't open it and I can't close it! The Island Writer paid a visit to my mom today. Millie is chatty, extremely personable and outgoing....and truly in no way looks or acts her age. She sure is an inspiration to me if that's what going on 81 looks like! For all you bloggers who know Millie from her blog....I can guarantee she's every bit as sweet, entertaining, humorous and genuine as she is on her blog. Sounds like they had fun! Wow!! It's been a long time since I made my last post. Where to start? First I want to thank my son Steve for keeping my blog going and making progress reports about my sick computer. All is well now and I am back in business. At the first session we were asked to zero in on a theme and then had those pictures scanned to size. The collage will be in a 5x7 frame. Once we did that, the next step was chosing appropriate fabrics for the background. My husband had many varied interests - He loved gardening, was a magician, took pride in his work, was a loving husband and father so finding the right material and captions was easy and fun. The last class will be held this Tuesday. I don't see how we can complete this collage with only one more session. Steve again. I'm here setting my mom back up on the computer.